Results-driven industry expert with more than 30 years of verifiable contributions in areas of operations, sales, customer relations, management, new business growth, and staff development. Known as an influential and recognized leader with a special talent for building new buisness relationships and productive work environments. Contact regular and prospective customers to demonstrate services, explain service features, and solicit orders. Use technical knowledge to recommend services to customers, based on customers' needs and interests. Answer customers' questions about services, prices, availability, capability, capacity, and credit terms. Consult with clients after sales or contract signing to resolve problems and to provide ongoing technical support. Provide customers with samples and catalogs. Monitor market conditions, product innovations, and competitors' products and sales. 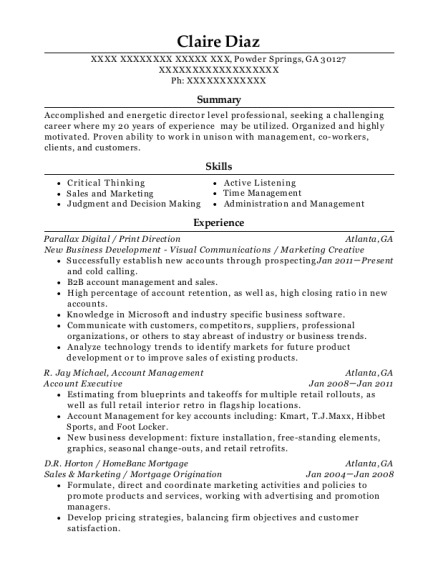 Perform administrative duties, such as preparing sales budgets and reports. Develop operating plans and schedules for contract manufacturing operations. Oversee plant operations for 24/7 manufacturing facility. Direct reports include 2 Directors and 7 Managers for Manufacturing, Quality, Inventory Control, Maintenance, and R&D. Review daily production, reports, maintenance, and other records associated with contract manufacturing operations. Identify opportunities to improve plant equipment, controls, and process controls. Source and purchase new or used manufacturing and processing equipment. Monitor and plan improvement for plant efficiencies on a line-by-line basis for each shift of production. Manage plant projects; work within budget and scheduling requirements. Work with creative directors to develop design solutions. Hire, train, and direct staff members as business needs change and grow. Develop and implement production tracking and quality control systems, analyzing production, quality control, maintenance, and other operational reports to detect production problems. Handle all customer audits and FDA inspections. Develop budgets and approve expenditures for supplies, materials, or human resources, ensuring that materials, labor, and equipment are used efficiently to meet production targets. Initiate and coordinate cost control programs. Institute employee suggestion and involvement programs. Maintain current knowledge of the quality control field, relying on current literature pertaining to materials use, technological advances, and statistical studies. Review plans and confer with research and development staff to develop new products or processes. Review processing schedules and production orders to make decisions concerning inventory requirements, staffing requirements, and work procedures, considering budgetary limitations and time constraints. Hire, train, evaluate, counsel, and motivate staff to meet company objectives. Set and monitor product standards, examining samples of raw products and components, direct testing during processing to ensure finished products meet requirements. Work with technical and R&D staff to develop new and innovative packaging. Recommend procedures for facility or equipment maintenance or modification, including the replacement of machines. Direct and coordinate activities involving sales of manufactured products, mainly plastic bottles and caps. Confer with potential customers regarding plastic component needs and advise customers on types of components to purchase. Direct clerical staff to keep records of export correspondence, bid requests, and credit collections. Direct, coordinate, and review activities in sales and service accounting and record keeping. Assess marketing potential of new and existing customers, considering statistics and expenditures. 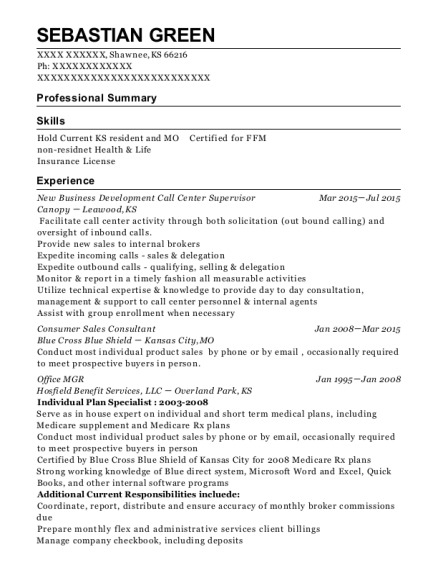 This is a resume for a New Business Development in Lakewood Township, New Jersey with experience working for such companies as C Care LLC and C Care LLC. 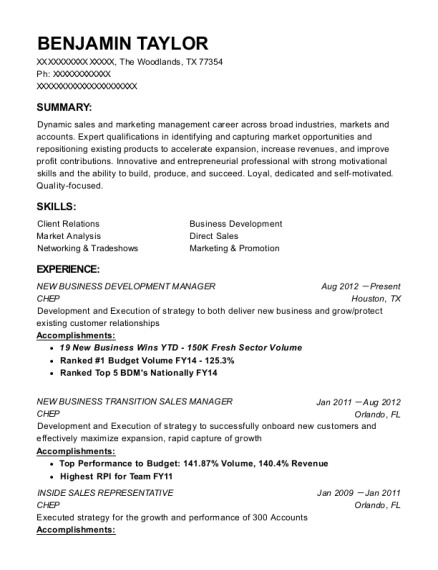 The grade for this resume is 0 and is one of hundreds of New Business Development resumes available on our site for free. 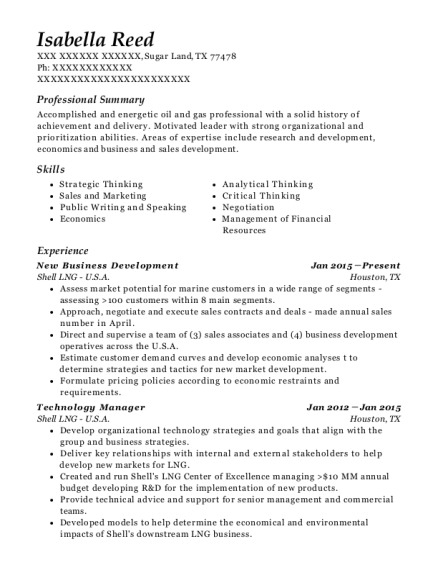 Use these resumes as templates to get help creating the best New Business Development resume.